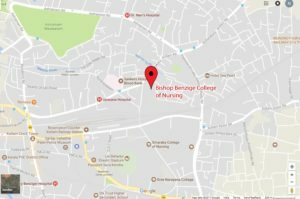 BISHOP BENZIGER COLLEGE OF NURSING, unit of Bishop Benziger Hospital Society, Kollam, Established in 2004 by the Latin Catholic Diocese of Quilon, Affiliated to Kerala University of Health Sciences, Thrissur-680 596 web: kuhs.ac.in. Situated Sastri Junction, Near Jyothi College Kollam. From Kollam Railway Station ½ km. From Kollam KSRTC Bus Stand 1 km.